Hello everyone! Today I have a tutorial for you that is both project based and technique based. We will be making a lovely pin that will also highlight a fun way to use Gilders Paste. 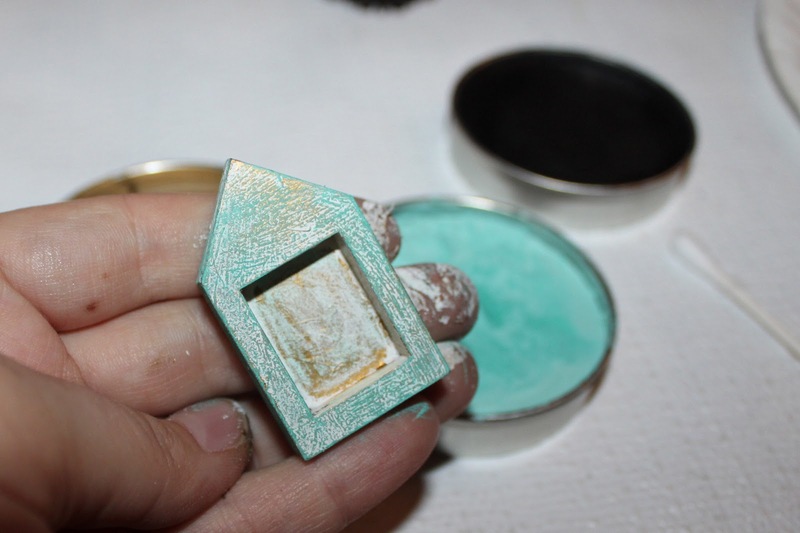 If you've not used Gilders Paste before, you are missing out. The base for my pin is a Masonite House Shrine Kit. 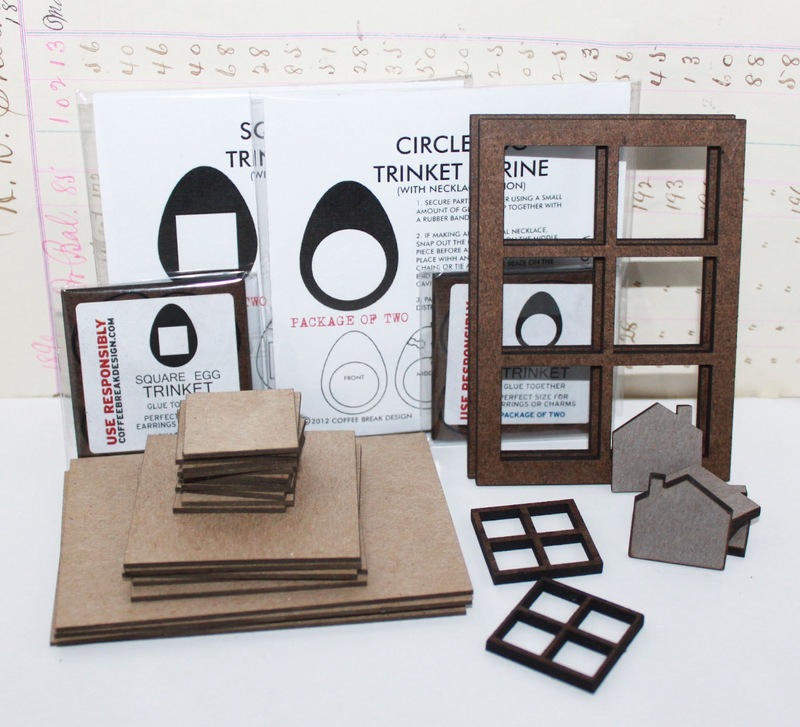 Start by putting the kit together following the instructions. It's very easy and requires just a bit of glue. You can also personalize you pin by adding an initial. I'm using a .5" Masonite J for "Joanie" on my piece. 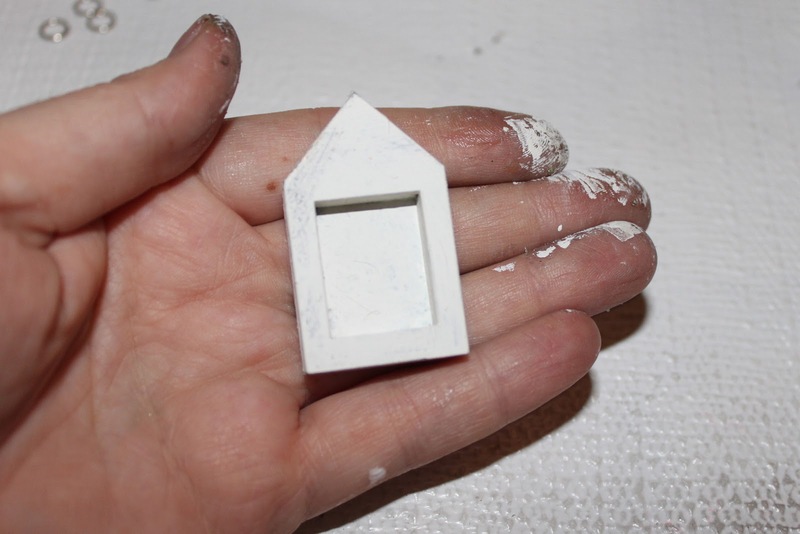 Once your House Shrine Kit is assembled, roughly paint the house with some white acrylic paint. 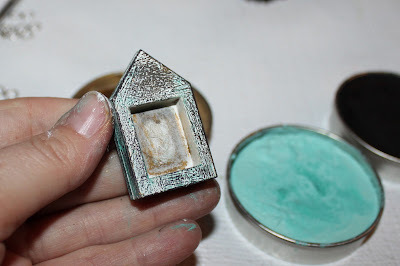 You'll want to use a large paint brush and apply the paint on pretty thick. Normally I dislike brush stroke marks, however for this project you will want them. So paint it on thick and let those brush strokes show. You'll see why in a minute! 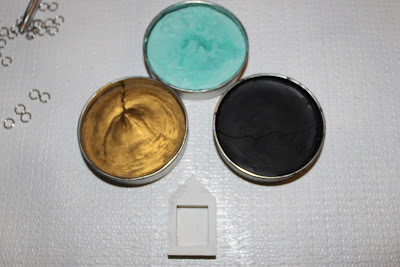 Let your paint dry fully, and select your Gilders Paste Colors. I'm using Black, Patina, and Inca Gold. For those of you who are not familiar, Gilders Paste is a wonderful wax based medium that can be applied to metal, painted surfaces, wood, resin, ceramic, wax, and more! It can be layered and mixed to achieve wonderful patinas. What I love most about it, is how it goes on in layers, offering a great deal of control. You can build the layers until you are satisfied, and the metallic colors have a wonderful shimmer! 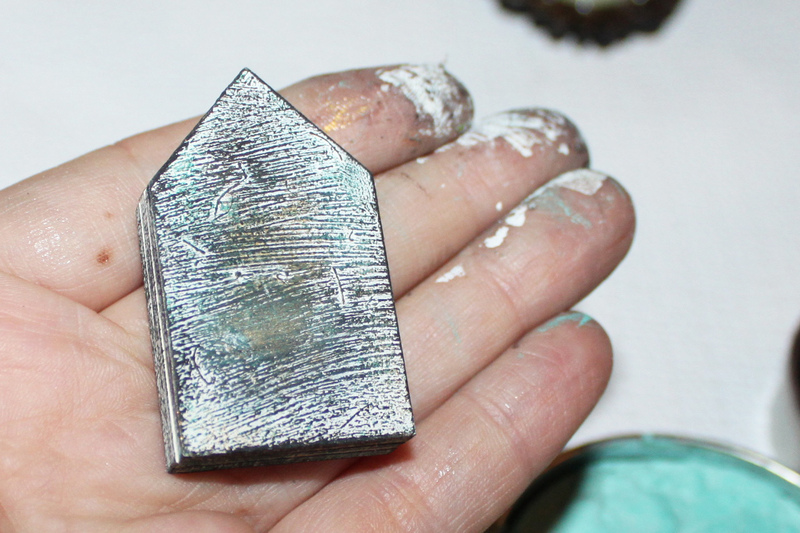 If you want to learn more about Gilders Paste, you can view my other tutorial here. Begin by adding some Inca Gold with a Q-Tip. Normally I use a fingertip, however since I was going to apply several different colors, the Q-Tip was a better option. See the wonderful texture appearing on the brush strokes! 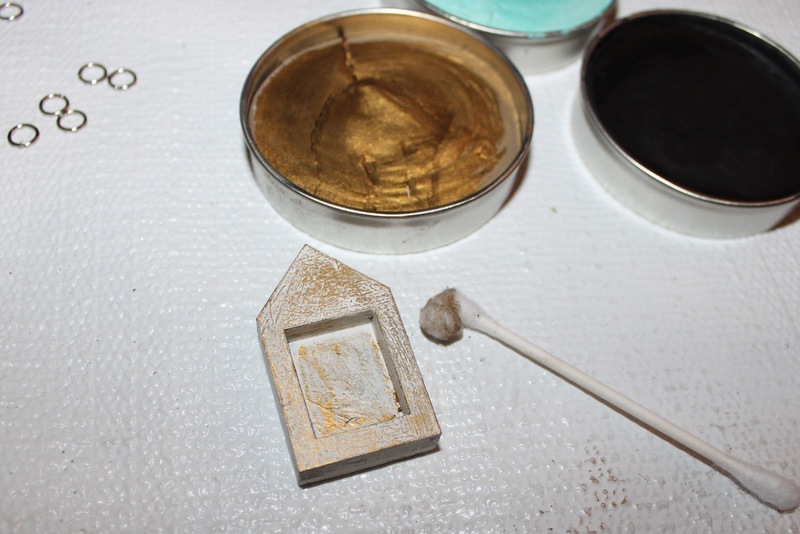 After the Inca Gold dried (about 5 minutes) I added some Patina Gilders Paste. Finally, I added Black Gilders Paste, particularly around the edges. The Black really makes the piece pop. As you can see, the Gilders Paste adhered to the raised part of the brush strokes, creating wonderful color and texture! Brush strokes can be a good thing. 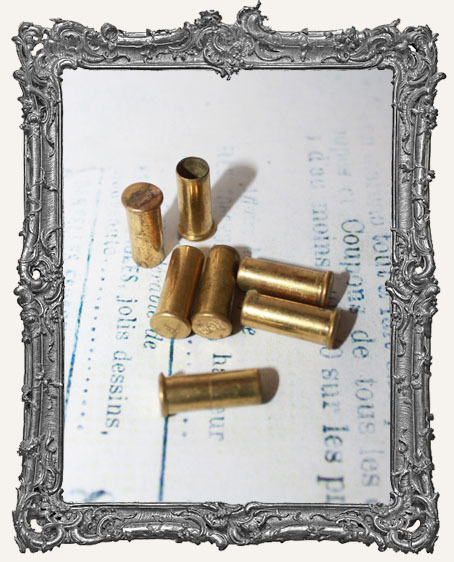 You can personalize your piece by adding special things inside. My friend Joanie loves anything old and antique, or "junk" as she calls it. 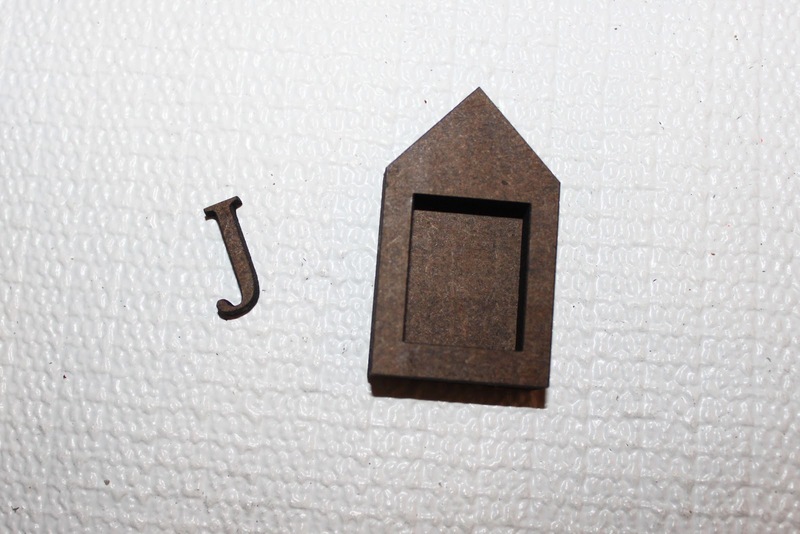 I attached the small pieces to the inside of the house using E6000 and a toothpick. You could also fill your house with resin, including various treasures. 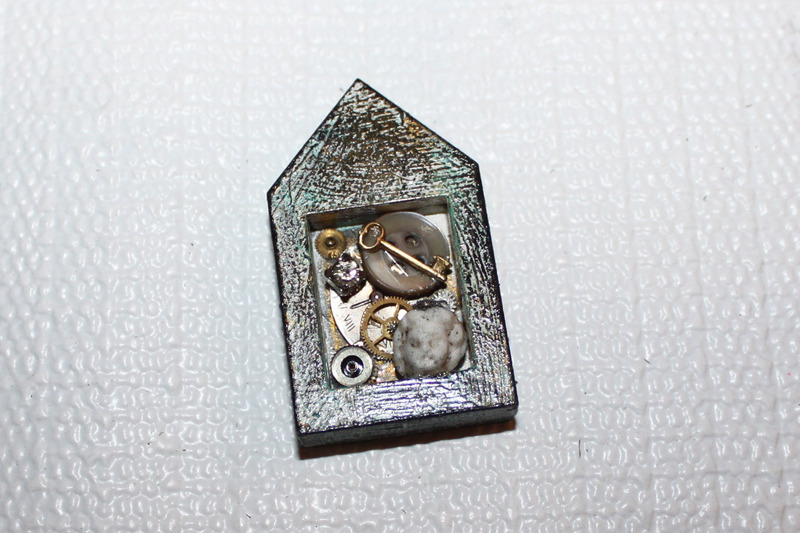 I used vintage buttons, rhinestones, gears, a watch face, a tiny key charm, and a small frozen charlotte head. All things that Joanie loves! I attached my .5" Masonite J to the front using E6000 (you can also use Gilders Paste directly on the Masonite, however I liked the natural look) and also added a brass gear. Finally, I attached a silver pin back using E6000.﻿ These make wonderful gifts. Joanie loved her special pin and wears it all the time! Treasures: Small Frozen Charlotte Doll Head, Tiny Key Charm, etc. FREE Belle Roses Digital Collage Sheet! Hi everyone! In honor of our 1500 fans on Facebook, I'm offering this lovely Digital Collage Sheet to you FREE as a thank you for your love and support! NEW Tim Holtz Idea-ology in the Shop! Just a short and sweet post to let you know we now have the NEW Tim Holtz Idea-ology in stock! 17 fabulous goodies! I know several of you were waiting. The Cash Keys are my favorite! What's your favorite? 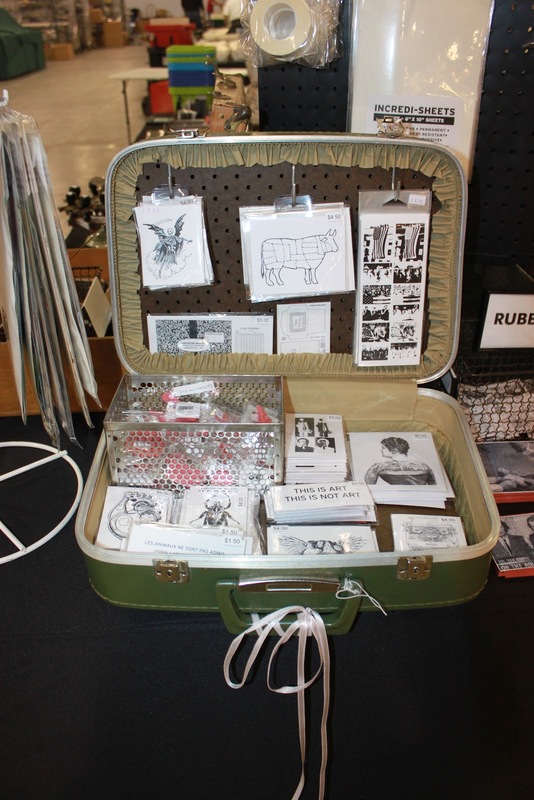 New Goods in the Shop, Storewide SALE, and a Honeycomb Paper GIVEAWAY! Hello everyone! I've been busy doing some spring cleaning and listing LOTS of new things on the site, including these fabulous Honeycomb Paper Kits! You get 12 sheets all for one great sale price of 4.99 (while supplies last). 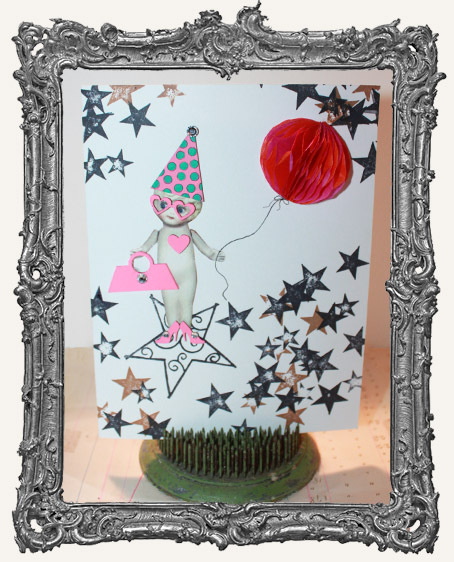 Think vintage halloween decorations! Remember those? They were made from this fabulous paper. 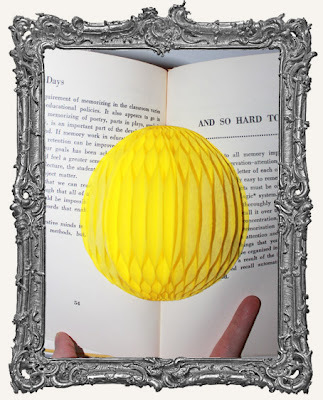 You can cut the paper with scissors OR run it through a diecut machine. Any symmetrical shape will work! You can put your pieces inside an altered book or card for a fun surprise! 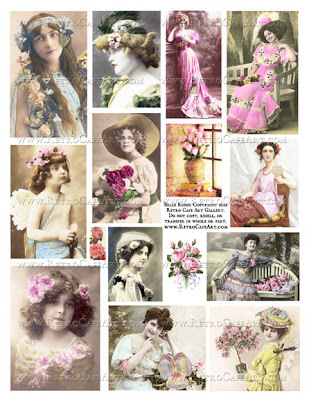 Or right on the front of a card, ATC, collage, and more! The paper set is a great deal, normally one piece of paper would cost more than the entire set of 12! ﻿We also have Coffee Break Design Stamps and Acrylic Blocks with handles! But grab em' up quick - many of the stamps have very limited stock! And Bullet Casings - great for Steampunk Art and Jewelry! 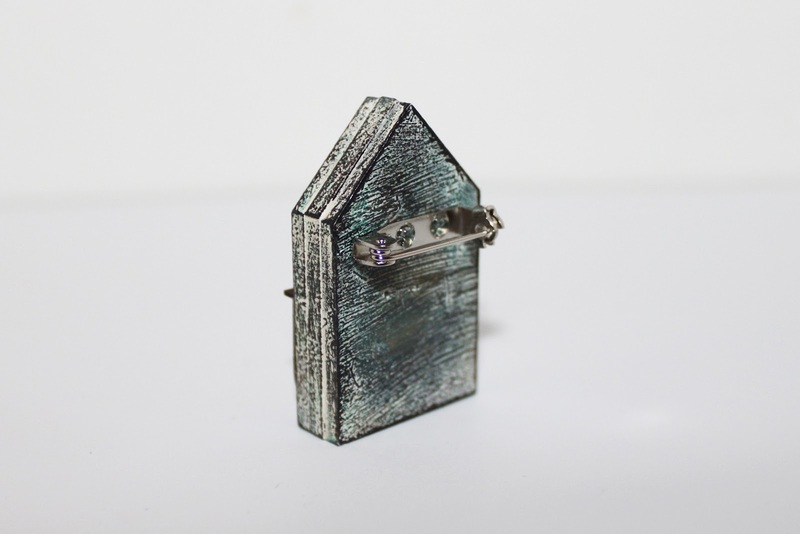 Check out this fabulous piece by Annette Husband! 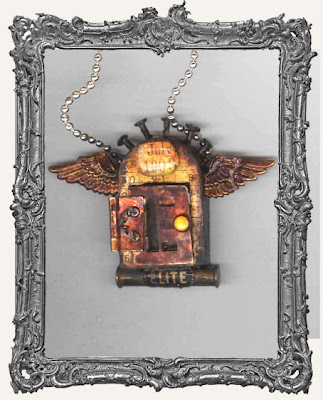 She used our Shrine Pendant Kit as the base and added our Sweet Brass Wings. I just love Annette's work! Annette also made these wonderful rings using our Ring Blanks and Ice Resin. I also spy one of our German Glass Eyes! She also made this cool bracelet using our vintage typewriter keys and Ice Resin. Thank you for letting me share you work Annette! You are so talented! Check out ALL the NEW goodies HERE! 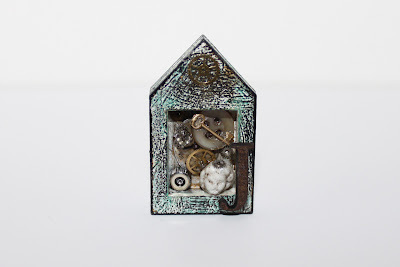 New Melissa Frances, Dylusions Stamps, Vintaj Metal Patina Kits, Jewelry Findings, and SO much more! 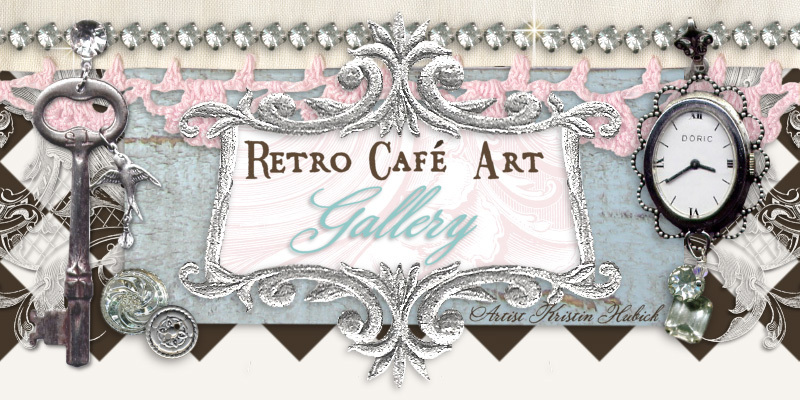 As I mentioned in my last post, Retro Cafe Art Gallery is the sponsor this month over at the Ginersnap Creations Challenge Site. 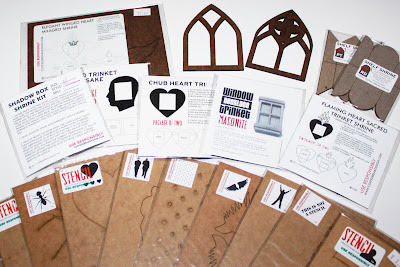 For this week's Border Punch challenge, we are offering this SUPER prize pack just stuffed with Shrine Kits and Stencils. You must hop over to their blog and see the wonderful Design Team work that has been posted as well. 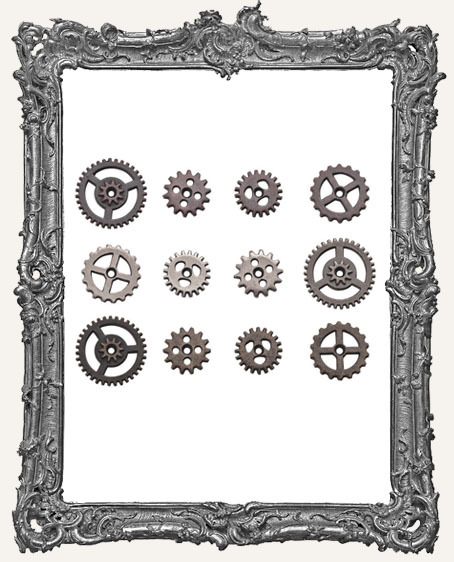 We supplied their team with an assortment of Digital Collage Sheets and the work has been just amazing! Of course the Retro Cafe Art Gallery Design Team never dissappoints either. Go check out the art samples and challenge rules HERE. 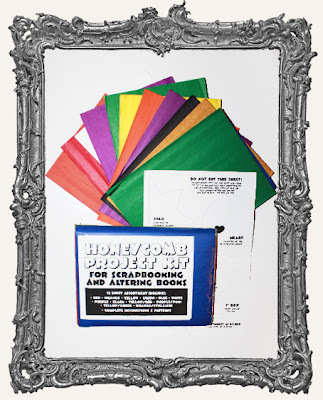 And how about a GIVEAWAY for some Honeycomb Paper Kits! 1. To enter, simply leave a comment on this post letting me know what you would do with some honeycomb paper! 2. On Thursday March 29th, I'll use a random number generator to select THREE winners to receive one of the Honeycomb Paper Kits! 3. If you are a winner and already a Facebook Fan, you'll receive an extra goodie too! Go here to 'like" us. Let me know in your comment if you are a fan, and please only leave one comment. Good luck and happy Spring! 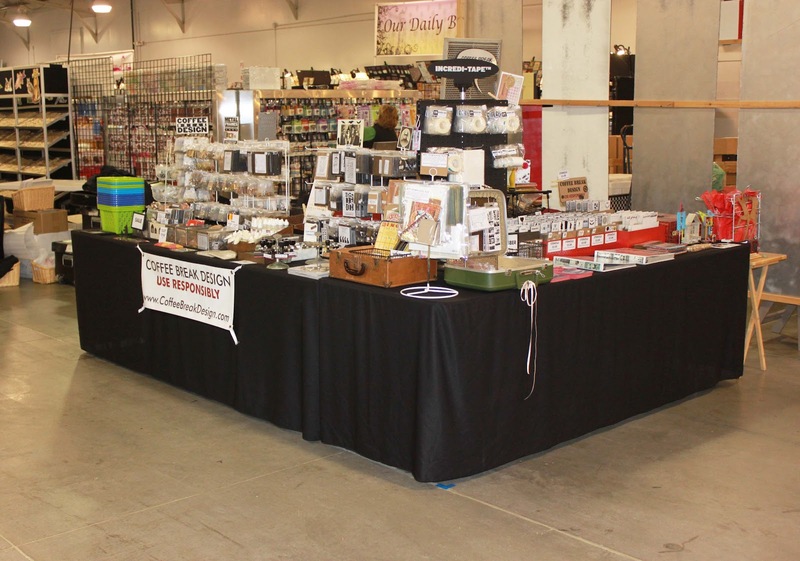 Giveaway Winners, Heirloom Show Photos, and Gingersnap Creations! 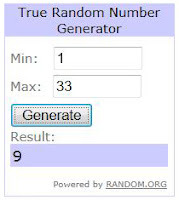 The lucky winner of the Stencil Prize Pack is #9, Zoe! And the winners of the new Egg Shrine Kits are #4 Jennifer, #7 Kris, #16 KimMJ, #21 Patti, and #33 Caroline! Winners, please email me at retrocafeart@gmail.com to claim your prizes! Congrats to all the winners! 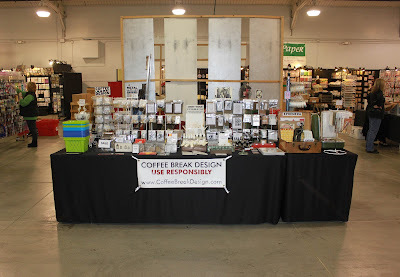 This past weekend Retro Cafe Art Gallery and Coffee Break Design participated in the Indianapolis Heirloom Productions Convention! Here are a few photos of our booth. 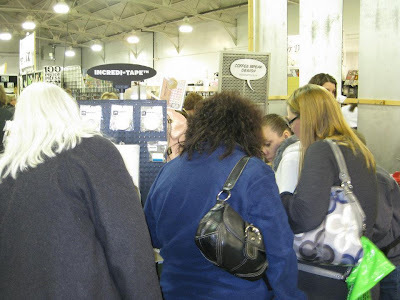 I really enjoyed meeting so many wonderful customers, including some of our fabulous blog readers (you know who you are!). Shows such as this are a lot of work, but also a lot of fun! We have a few more lined up this year, which I will be announcing as they get closer. We had a great spot for our booth, right by the front door! And rubber stamps! 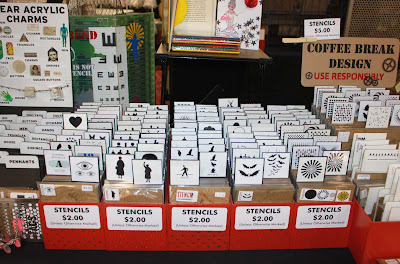 Just before the show I pressed out my first rubber stamps using the Coffee Break Design Vulcanizer. I can't wait to make more, and will hopefully get some listed on the site soon. Our booth was pretty busy most of the time. A big HUGE thanks to my helpers Joanie and Donna - you both rock so much! You can expect we will be at the Indy show every year since it's our home city! Thank you again to all the wonderful customers who came out to support the vendors. 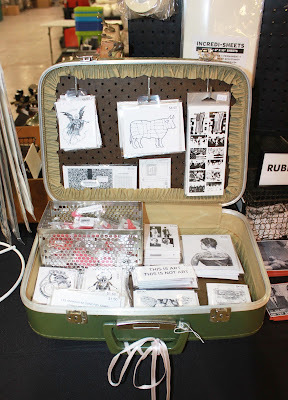 If you want to see more photos of our booth you can see them HERE on Facebook. And in other exciting news, Retro Cafe Art Gallery is this months Gingersnap Creations sponsor. So what does that mean? Ginersnap Creations will be posting several awesome challenges throughout the month, and we will be providing the prize packs! 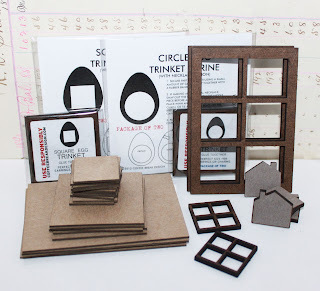 Here is the first prize pack we are offering just filled with ATC Frames and Windows, ATC Blanks, Inchie Windows, and Inchie Blanks. 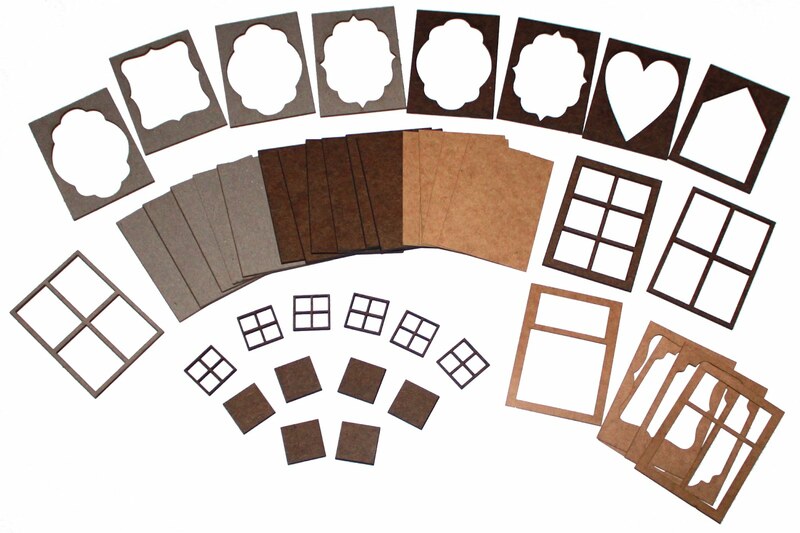 Get on over to the Gingersnaps blog and find out how to play. There are also several amazing art samples by the Ginger Design Team and the Retro Cafe Art Gallery Design team, so you don't want to miss it. Check it all out HERE.